Lately, I've been desperately trying to slow down the hours, days, and weeks. It's my favorite time of year (much like everyone else in New England) and I'm savoring these crisp and sunny days before the winter air settles in. It can be easy to let this time of year pass you by in the city. You see trees with scarlet and gold leaves here and there, but the colors don't overwhelm you the way they do in the mountains. This past weekend I zipped up to my old stomping grounds in Vermont, and boy, do I miss it there. I moved to Burlington when I was eighteen, and quickly fell in love with its mountains and its people. Vermont felt like home right away. My first fall there was basically my first fall, ever. I remember walking down to Lake Champlain, looking out to the Adirondacks and thinking that their slopes and ridges looked like they were on fire. The colors burned so bright they blazed, and it took my breath away year after year. Still does. From September to November I was determined to spend as much time as I possibly could outside. There were sunrise and sunset hikes on Camel's Hump, weekends in the apple orchards, pumpkin picking, and long solo runs along the lake. Though the air grew cooler and the days shorter, I always found myself feeling indescribably warm this time of year. A combination of beautiful views, good company, and the sweet and spicy scents often floating from the kitchen made for happy memories in one of my happy places. So, this granola. While it can't take me back in time, it sure does bring back a whole lot of happy memories with it's warming, nutty, and spicy flavors. It's cozy and inviting and makes both your heart and belly feel full. I like to make big batches of it to sprinkle on yogurt, add to oatmeal, and to snack on morning, noon, and night. I hope you enjoy this simple recipe as much as I do :). In a large bowl, combine oats, flax seeds, walnuts, pepitas, spices, and salt. In a small pan, melt the refined coconut oil and then whisk in pumpkin puree and honey. Mix well until the contents are evenly combined. Add to the dry ingredients and mix with a wooden spoon or spatula until all dry ingredients are coated. 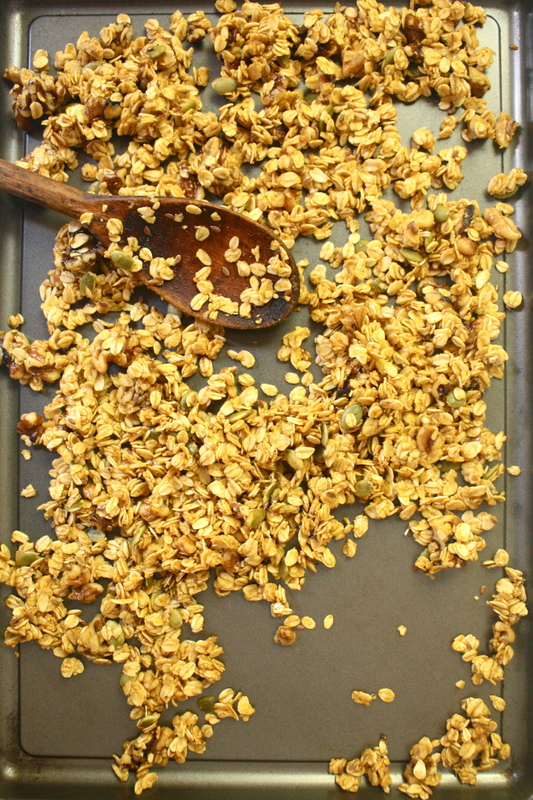 Once golden brown, remove your granola from the oven and let it cool. Enjoy warm over yogurt, with a splash of milk, or store in an airtight container to enjoy at a later time. Let me know how your pumpkin granola turns out by tagging #HSrecipes on instagram, and be sure to follow me @homesweet_mary. Happy baking!